TORONTO—As the United States’ neighbor to the north, Canada’s hotel project pipeline is white hot. 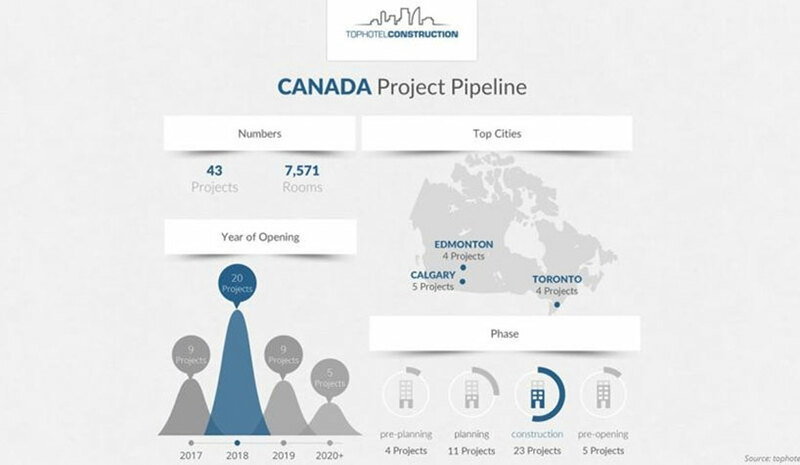 Canada’s pipeline overall has a total of 43 projects that, once completed, will yield 7,571 combined rooms. The cities leading the way for hotel development in Canada right now are Toronto, Edmonton, Calgary and Ottawa. The majority of the 43 projects are currently under construction, with nine of them preparing to open for guests by year’s end, while 20 are slated to make their own debuts in 2018. Currently in the pre-opening phase, the Hotel X Toronto will soon open its doors, offering a total of 406 rooms. A distinctive lakefront urban resort, the property brings a mix of hospitality, sports and entertainment options in an urban setting. Housed in a modernistic tower, the property rises 29 stories above the scenic waterfront below. It is the only hotel on the historic grounds of the Canadian National Exhibition, located inside the Princes’ Gates and opposite the Direct Energy Centre. The hotel is also connected by skybridge to the Allstream Centre. Hotel X Toronto also aspires to be a LEED-certified project as evidenced by its living green wall behind reception with clusters of live trees and greenery planted elsewhere in the lobby. Currently in the planning process, this hotel aims to be opened by the second quarter of 2019 and, when it is complete, it will have a total of 400 rooms. This conversion project will encompass a redesign of the gaming floors. Additionally, phase one will include updates to the arrival experience, porte cochere, signage, racetrack and grandstand. Pending required approvals, the subsequent expansion program will bring the addition of a Hard Rock Hotel, Hard Rock Live entertainment venue, a Hard Rock Cafe & Center Bar, and a Rock Shop where fans can purchase the brand’s merchandise. An expansive gaming space with additional slot machines and table games is also planned. The property will be a dual-branded hotel, housing Residence Inn by Marriott and Courtyard by Marriott. A new-build, 26-story hotel will be constructed on the former Willow Inn site in Kelowna, BC.